Image example Emmanuel Macron France President. 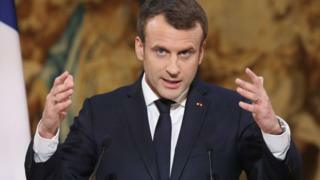 France President Emmanuel Macron dey come Nigeria for July and e dey hope to help ginger creativity and youth development. France Ambassador for Nigeria, Denys Gauer, nack di tori when im visit Nigeria's Speaker of di House of Representatives, Yakubu Dogara. Mr Gauer talk say oga Macron sef don work for Nigeria before for dia embassy for Abuja so di future and and how di country go grow dey im mind. Im say even as di relationship between Nigeria and France for di last few years na mainly ontop security mata, Macron dey hope say di visit to strengthen di relationship especially for youth development, culture and creativity. Image example Nigeria President Muhammadu Buhari dey present Budget to National Assembly. Mr Macron go do speech give di joint session for National Assembly for di visit. House speakers Dogara say Macron na "man of our generation" so di lawmakers go happy to receive am. Since im become President, Macron don visit five African countries.